at Japanese izakayas (casual drinking establishments), often paired with ice-cold beer. and featuring an extensive global wine list curated by a top sommelier. including a nod as the #1 restaurant destination in Japan for tourists by Live Japan. At Toriko, you can enjoy delicious, delicately crafted yakitori and a carefully-curated global wine list from a top sommelier in a sophisticated and elegant atmosphere. The restaurant is well-appointed for any occasion from business meals and anniversaries to weeknight dinners with friends. Guests will experience the highest level of hospitality and service, beginning with a warm welcome from specialized yakitori chefs, and an invitation to sit at the beautiful ‘shiraki’ open counter. The yakitori at Toriko is grilled by experienced chefs who meticulously rotate each skewer at precisely the right moment, fine-tuning the grill flames to lock in moisture and umami flavor. Every part of the chicken is utilized, and each piece is prepared with its own unique method using four different types of ‘tare’ (sauce) and three different varieties of ‘shio’ (salt). Top-ranking Japanese yakitori chefs must have years of experience, adept butchering skills and an intimate knowledge of specialized grilling techniques. Toriko’s head chef has over 15 years of yakitori grilling experience, and he butchers all of the meat in-house daily. Toriko’s extensive wine list is curated by a top sommelier, and features relatively light bodied options chosen specifically to pair well with chicken. The list is global, though it showcases the wines of France. Options are available by the glass or bottle, and range in price from approachable to high-end. 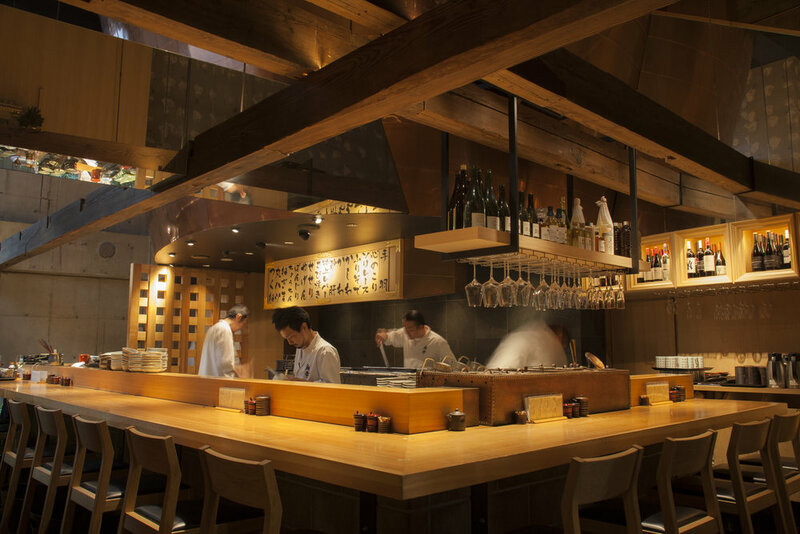 The original Toriko opened in 2011 in Nogizaka, Japan, part of Tokyo’s Roppongi district. At the time, yakitori was popular at Japanese izakayas (casual drinking establishments), and was often paired with beer, but Toriko broke the mold by marrying it with wine. The restaurant expanded to other popular neighborhoods in Tokyo such as Ebisu and Ginza, and became a favorite destination for both locals and tourists. The concept was so popular that it expanded to twelve locations and garnered numerous accolades, including a nod as the #1 restaurant destination in Japan for tourists by Live Japan in 2018, and an award for best Yakitori in Tokyo by Yummy Japan. In 2017, Toriko opened a spin-off brand in Taiwan called Torishin, which became an instant hit. Now in 2018, Toriko has opened its first U.S. location in Manhattan, bringing the finest yakitori and wine pairings to the city. Yakitori was created 300 years ago in Japan, and has become a cultural staple, ubiquitous at izakayas and restaurants around the country. It is composed of three main components: grilled chicken skewers, specialty sauce, and various types of salt. It is deceptively simple, and varies greatly based on preparation technique and location.